Azinga Fuzile dazzles against Romulo Koasicha, looks toward title shot. 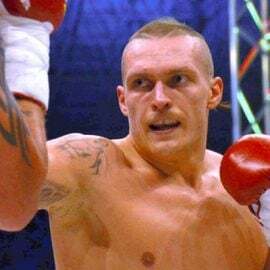 South Africa’s Azinga “Golden Boy” Fuzile had all the pressure in the world on him on Sunday afternoon at Nangoza Jebe Hall in New Brighton, Port Elizabeth, when he took on Mexican Romulo Koasicha in a 12-round junior lightweight scrap. 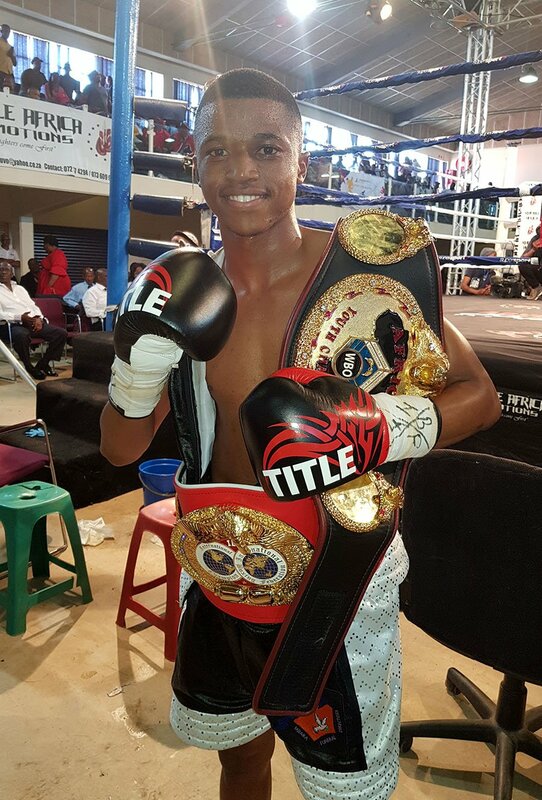 Not many fans outside of South Africa may have heard of Fuzile, but in the Eastern Cape region — which has produced champions like Welcome Ncita, Mbulelo Botile, Vuyani Bungu and current WBO bantamweight boss Zolani Tete, to name but a few — Fuzile is the next big thing. 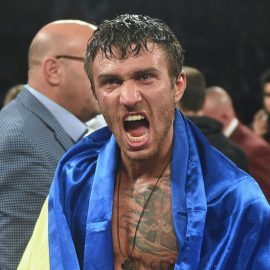 Koasicha’s big claim to fame was that he put on a gritty effort against Vasiliy Lomachenko in a challenge for the WBO featherweight championship before body shots finally did him in in the 10th round, the only stoppage defeat of his career. 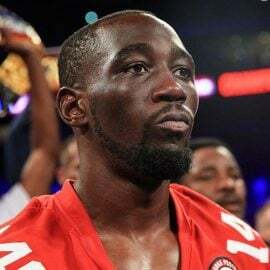 Before that, he also took future IBF featherweight titleholder Lee Selby the distance. 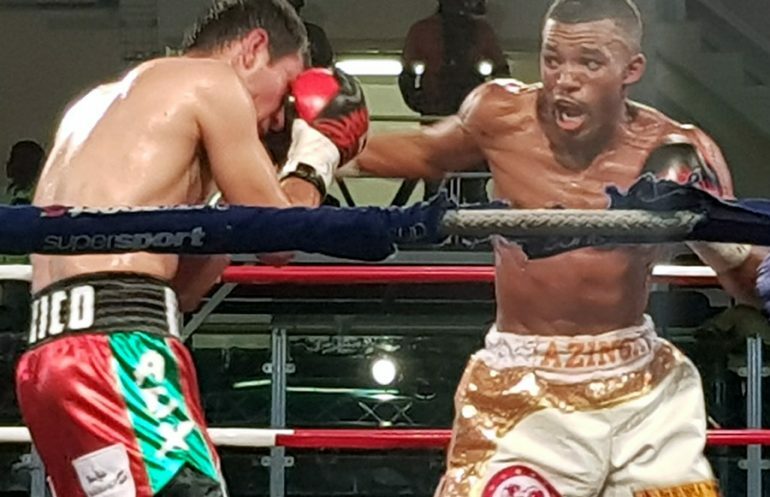 Fuzile started the first round boxing in his sideways southpaw stance before snapping Koasicha’s head back with a right uppercut and digging a hard left hook to the body. One of those went astray and landed south of the border, which caused Koasicha to take a timeout before he jumped back into the fray. Moments later, Fuzile brought the crowd to their feet by dropping Koasicha with a left uppercut. Koasicha, who has a Japanese grandfather mixed into his Mexican heritage, has tough in his genes and it came as no surprise when he got up to continue. When Koasicha got Fuzile cornered in the second round, he let his hands fly, but almost all the shots were blocked by Fuzile’s “Philly shell” defense. Fuzile responded with two lightning-fast right hooks around Koasicha’s guard before slipping out of the corner and sliding away along the ropes with Koasicha in pursuit. By the third, Fuzile simply planted himself in the corner and invited an attack from Koasicha, who duly obliged. 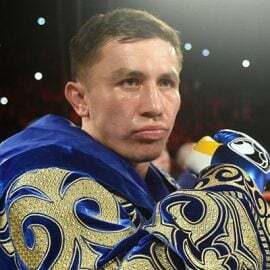 Again, most of the Mexican’s barrage was blocked and Fuzile responded with lighting combinations that hit the target; then he was out again, sliding along the ropes. 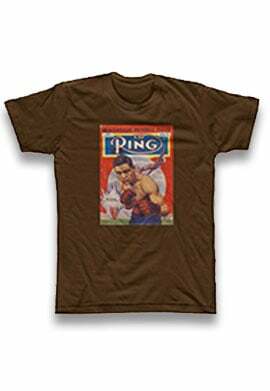 Every so often, he would throw a right hook and spin out to his right with the momentum of the punch, then throw the left and spin out the other way. Such was his dominance that it seemed unlikely that the fight could go the distance. Koasicha, however, has a anvil for a chin. In the fifth, a right uppercut-left hook combination followed by a straight left sent the spray flying and got a big pop out of the crowd. Fuzile moved this way and that way and kept peppering Koasicha with combinations, but the Mexican was going nowhere. The pattern was set, with Fuzile alternating between circling the ring, side-stepping Koasicha’s efforts, and planting his feet, blocking and punching it out with his opponent. Fuzile coasted for the last two rounds. Koasicha was mostly ineffective but relentless, finally having some minor success by landing a few shots in the 11th round. Fuzile put on a stick-and-move routine in the last round as the raucous home crowd sang him to the finish line in true African style. 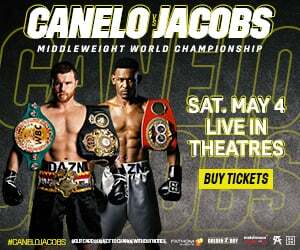 The decision was a mere formality as Fuzile won by scores of 118-109, 119-108 and 119-108 to bring his record to 14-0 (8 KOs). 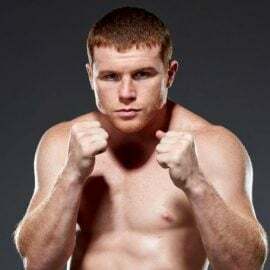 Koasicha drops to 27-8 (17 KOs) and despite losing by a wide margin, was extremely game and must be commended for making his faster, more powerful and more talented opponent work hard for the victory. 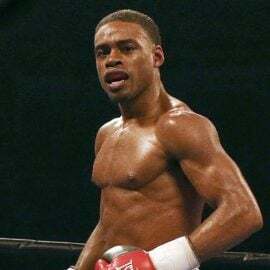 On the undercard, hot southpaw junior flyweight prospect Sive Nontshinga scored his seventh consecutive knockout in as many fights, dispatching his more experienced opponent, Adam Yahaya (19-5-1, 8 KOs), with a left to the solar plexus in the first round. Junior featherweight Ayabonga “Jay Jay” Sonjica moved to 8-0 (7 KOs) when he scored an eighth-round stoppage of Asiphe Ntshili. 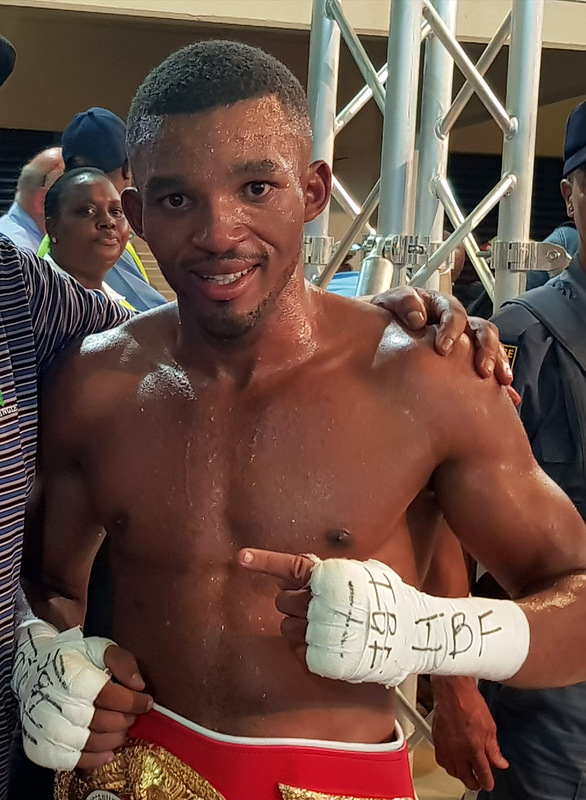 Flyweight Luyanda Ntwanambe (6-0-1, 4 KOs) also looks like somebody to watch after knocking out his opponent, Xolisile Voyi, with a big right hand in the fourth round. South African junior lightweight champion Phila Mpontshana retained his title on points against Koos Sibiya in a rough, often scrappy affair. This was a rematch, and just like in their first encounter, there were those who thought that the challenger did enough to win, although I thought that the champion just edged it in a fight that was hard to score. All in all, the new promotional kid on the block, Rumble Africa Promotions, put on a very entertaining afternoon and it seems that Eastern Cape boxing in South Africa is as strong as ever.